Dynamic Linking works like a multilingual concordance search. It displays all the segments which contain particular pairs of terms. This quickly and easily provides you with an overview of where, and in what context a source-language term and its translation are used. You can use Dynamic Linking also if only a source language term exists. Dynamic Linking displays examples found in the currently used reference material, i.e. the project/subject the translator is working on. The same term might have been translated differently in different projects: Example: English driver – German Fahrer or Treiber. Dynamic Linking displays examples embedded in the context of the segment they appear in. Dynamic Linking does not require additional terminology maintenance effort because examples do not need to be added to the dictionary but are created dynamically when Dynamic Linking is called up. Examples in a dictionary requires great maintenance effort and may soon become obsolete. Dynamic Linking reduces the size of dictionary databases as the dictionaries do not need to contain the examples. As Dynamic Linking searches the reference material for terms or pairs of terms, this function only makes sense if you are working in a Transit project that contains reference material. There are several possibilities for calling up Dynamic Linking. This means that Transit provides the ideal solution for every situation. Transit displays the search results in the Dynamic Linking window (fig. 5-73). Please refer to section 5.11.3 “Dynamic Linking results” for more detailed information on this topic. How do I call up Dynamic Linking via the Transit Toolbar? 1 Position the mouse pointer over the resource bar and right click. 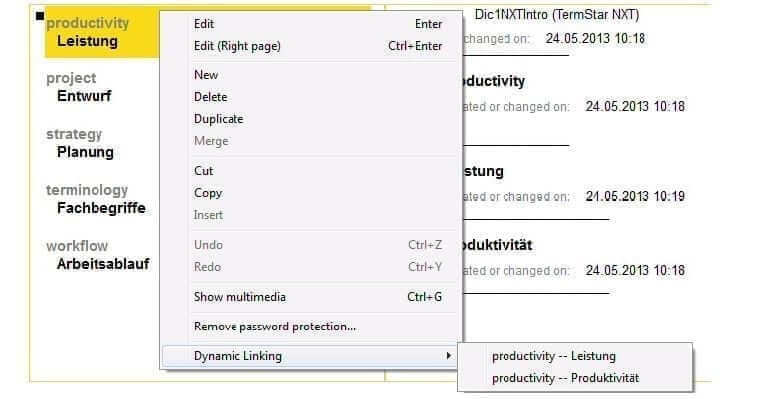 Select the Dynamic Linking tool from the context menu. Transit displays the Dynamic Linking window (fig. 5-73). 2 In the Source language and/or Target language fields, enter the term in the source and/or target languages which you want to search for using Dynamic Linking and click Search. If you want to use morphological search, please enter the base form of the term. Transit displays the Dynamic Linking window, containing the search results (fig. 5-73). Please refer to section 5.11.3 “Dynamic Linking results” for more detailed information on this topic. How do I call up Dynamic Linking from the Terminology window? 1 If Transit is displaying dictionary suggestions for the current segment, double-click on the symbol to the left of the corresponding entry. This is the fastest way of opening Dynamic Linking for a term or pair of terms. Alternatively you can open the context menu in the Terminology window by right-clicking on the dictionary entry in question. 2 Select the term or pair of terms for which you wish to call up Dynamic Linking. How do I call up Dynamic Linking from the dictionary? 1 Click on the TermStar tab. 2 Select the data record for which you wish to call up Dynamic Linking, and then open the context menu. 3 In the submenu, select the term or pair of terms for which you wish to call up Dynamic Linking. TermStar NXT displays the Dynamic Linking window, containing the search results (fig. 5-73). Please refer to section 5.11.3 “Dynamic Linking results” for more detailed information on this topic. First line – Similarity of match and name of the file in which the text was found. Second line – Source language and source-language segment (with highlighted search term, where applicable). Third line – Target language and target-language segment (with highlighted search term, where applicable). If necessary, you can use the context menu to open the reference file so you can view the context of the match. If you no longer require Dynamic Linking, you can close the window by clicking on X on the right of the titlebar. It is also possible to integrate the Dynamic Linking window with the user interface by docking it (for information on this, see the instructions under “How do I dock a standard window with the user interface?” in section 2.1.8 “The Transit toolbar”). In the Source language and Target language lists, Transit shows all the terms which you have searched for with Dynamic Linking since starting Transit. If you want to search again for a term that you have already entered, simply select it from the Source language or Target language list and click on Search. This feature is very helpful if you want to use different settings for different terms. 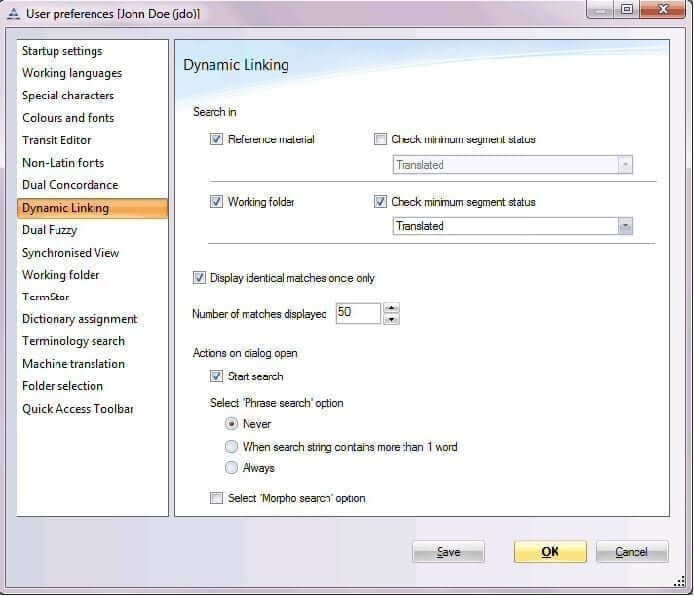 In the Dynamic Linking window, you can define various settings (see figure 5-73). Clicking Options takes you to the Dynamic Linking user preferences. From there you can configure additional, project-independent settings. You can find more detailed information on this in the section5.11.5 “Dynamic Linking – User preferences”. Minimum quality – Specify how similar the search term and the text in the segments should be in the source and target language. You can use this setting to define how similar matches should be. Phrase search – Select this option if you want Transit to search segments for text which is a 100% match for the search string. Source language – Enter the source-language term here which you want Transit to search for. If you only want Transit to search in the target language, leave this field empty and only enter text in the Target language field. Target language – Enter the target-language term here which you want Transit to search for. If you only want Transit to search in the source language, leave this field empty and only enter text in the Source language field. Morpho search – Select this option if you want Transit to take morphological criteria into account for Dynamic Linking. To do this, enter the base form of the term into the Source language and/or Target language fields. Transit will then also search the language pairs for conjugated and inflected forms. Match case – If you want Transit to take account of case differences for Dynamic Linking. Include all languages – This option is only available if you call up Dynamic Linking from TermStar NXT (see fig. 5-72). Select this option to determine whether TermStar NXT should only take the current source and target language into account for Dynamic Linking, or whether it should consider all languages for which there are entries in the data record and reference material. TermStar NXT also compares the French entry base de données in the data record with the text of the segments. As the sample segment 2 contains another term (banque de données), this segment does not match the data record entries for all languages. Dynamic Linking does therefore not display segment 2 but only the sample segment 1. TermStar NXT only compares the German and the English entry with the text of the segments. As these terms also appear in sample segment 2, the segments match the data record in the source and target language. Therefore, Dynamic Linking displays sample segment 1 and sample segment 2. 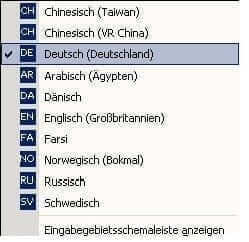 Please uncheck ‘Include all languages’ and try again. With the option unchecked, TermStar NXT would be able to find matches. If you want to display these matches, please uncheck Include all languages and search again by clicking Search. – by selecting Terminology | Dynamic Linking | Options in the ribbon bar. The user preferences for Dynamic Linking are the same as for Dual Concordance (e.g. language pairs to be searched, minimum segment status) (see section 5.10.3 “Dual Concordance – User preferences”). Download our latest ebook now. Working with Transit and Machine Translation Engines. Machine Translation (MT) systems can be used when working with Transit to add MT suggestions. In Transit, customer-specific, specially trained MT systems are used exclusively for machine translations during the import of project files. Therefore, they are referred to as Import MT. The project-specific settings for the Import MT are specified by the client or project manager on the Machine translation tab of the Project settings window (see “’Machine translation’ project settings” section). Import MT suggestions are displayed to you as translator in the fuzzy window, together with the fuzzy matches that may exist (see “Import MT suggestions in the fuzzy window” section). Machine translations by online services are supported only via the Transit editor. The translator needs to request them explicitly for individual segments (see section 5.5.3 “Manually requesting a machine translation” on page 241). Therefore, they are referred to as Editor MT. 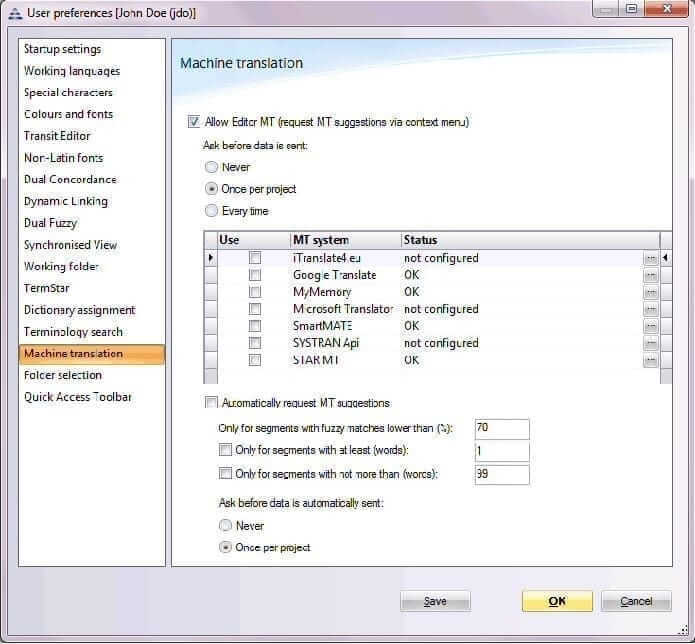 The settings for Editor MT are set by the translator using the Machine translation option of the user preferences. In the user preferences you can specify – independent of a project – if you want to use Editor MT. It allows you to manually or automatically request MT suggestions from online providers via the Transit editor. How do I configure the user preferences for Editor MT? 1 Select Transit button | User preferences. Transit displays the User preferences window. 2 Select the Machine translation option. Allow Editor MT (request MT suggestions via context menu) – Here you can turn the use if Editor MT on or off. It allows you to request MT suggestions using the context menu of the Transit editor. In the overview below all MT systems supported for use in the Transit editor are listed. OK – The MT system can be used. not configured – The MT system needs to be configured, i. e. the API key must be entered. – Button – Transit displays a window allowing you to enter the API key for using the respective MT system. – In the Use column, you can turn the use of an MT system on and off. Transit can only use one MT system at the time. Only for segments with fuzzy matches lower than (%) – Here you specify the quality of the fuzzy matches (in percent) below which Transit should automatically request a machine translation for a segment. Only for segments with at least (words) – Here you specify the quality of the fuzzy matches (in percent) below which Transit should automatically request an MRT suggestions for a segment. Only for segments with not more than (words) – Here you can specify that the segments should have a specified minimum length (i.e. segments that are too short are not sent). STAR/Transit has no influence on privacy policies, costs and quality! For machine translation, if requested by the user/customer, the texts and contents that are to be translated are transferred to the machine translation (MT) system and may be transferred to the provider of the MT system. STAR has no influence on the quality of the machine translation when the data is processed and translated externally in this way. No guarantee shall be provided for the correctness or completeness of such translations. STAR points out that the Internet is not considered to be a secure environment and data that is transferred online may be accessible by unauthorised third parties. STAR shall accept no liability for the security of any data that is transferred online. STAR shall be excluded from any liability for losses or damage of any kind that result from the transfer of data that is to be translated to the MT system or from the use of the MT system. Further processing and/or saving the data that is to be translated in the external MT system is not under the control of STAR. From the moment that the data is transferred to the MT system, STAR shall not be responsible for compliance with data protection regulations nor for compliance with confidentiality agreements. 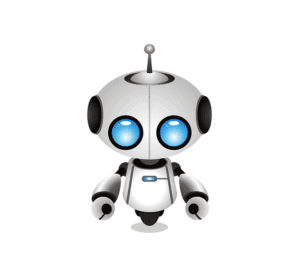 Machine translation may be a paid service that is offered by the machine translation system provider. Costs may be incurred through the use of machine translation. STAR does not have any influence on the amount or billing of these costs. This API key you obtain from the respective provider. Via the Check API key when closing the dialog option, you can check immediately if the API key is correct. In the additional row, Transit displays if the segment text has been transferred to the MT system with or without markups. If the respective MT system does not support the processing of markups, Transit automatically transfers the segment text without markups. In this case you will have to insert the markups after accepting the MT suggestion for your translation. How do I manually request a machine translation? 1 In the target-language window of the Transit editor, right-click on the current segment. Transit displays the context window of the target-language window. 2 In the context menu, select the Request machine translation entry. If fuzzy matches exist for the segment, Transit displays the translation suggestion of the MT system at the top of the Source Fuzzy window. This way the MT suggestion can be easily compared with the fuzzy match of the highest quality. Just like a fuzzy match, you can edit the MT suggestion and accept it for your translation. Transit helps you to store the language pairs of a finished project as reference material in a structured way. You can specify how the language pairs should be copied to the selected reference folder and simply resolve any naming conflicts. How do I store the language pairs of a project as reference material? 1. Open the desired project, in case it is not opened yet. 2. Select Reference material | Copy current project to reference folder from the resource bar. 3. 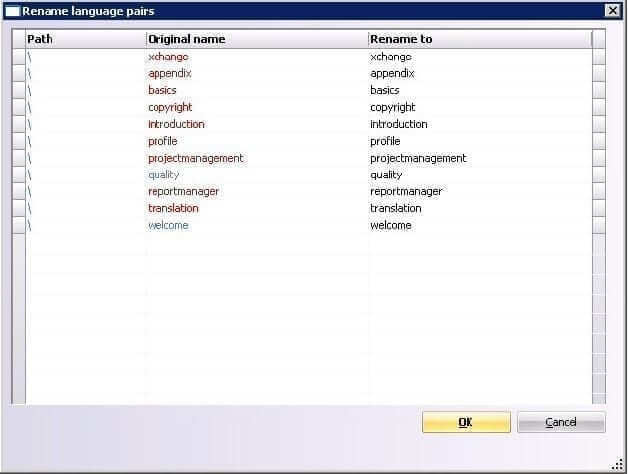 Specify the reference folder into which Transit should copy the language pairs. – Copy unchanged – Transit copies the language files as they are. – Add file-name prefix – Transit adds the string from the input field as a prefix to the language file names. As default displays the project name plus an underscore. However, the prefix can be changed as desired. – Copy to subfolder – Transit creates in the reference folder a subfolder with the name of the project and copies the language files in there. If language pairs are stored in subfolders, the subfolder structure is retained during copying. – for which the same customer as been specified in the project settings (Use as default for customer option). Confirm the settings selected by clicking OK. If no naming conflicts occur, Transit copies the language files as specified. In this case language files having the same name already exist in the reference folder. Select whether you want to overwrite the existing language files or rename the new language files. – Click Replace to overwrite the existing language files with the new ones. – Click Rename to rename the new language files and therefore retain the old reference files. Path column – Transit displays the relative original path if files from subfolders have been imported into the project. Original name column – Transit displays the original names of the new language pairs. Names for which a conflict occurs are displayed in red. Rename to column – Transit gives you the option to change the original names in order to resolve naming conflicts. Click OK to finish this process and to copy the new language files into the reference folder. How do I search my reference material? Select Reference material | Organise reference material from the resource bar. 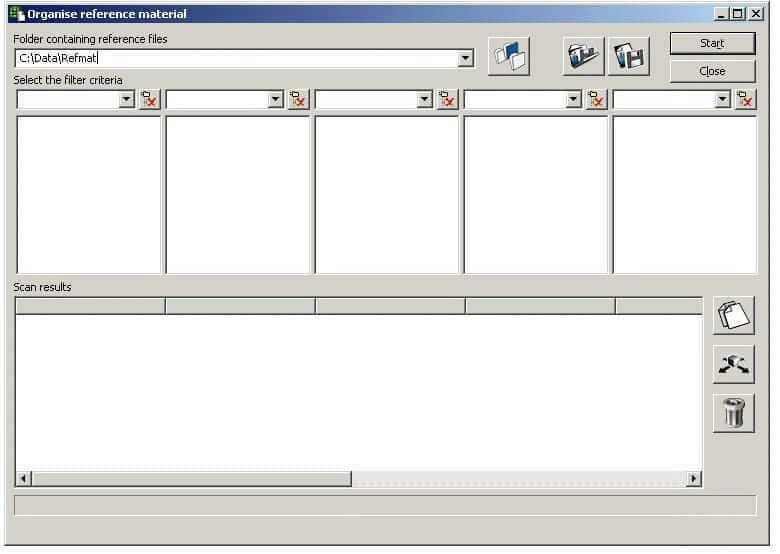 Transit displays the Organise reference material window. 2. Select the folder which contains the reference material. To do so, click on Select folder containing reference material. Transit displays the Select folder containing reference material window. 3. Select the folder containing the reference material and confirm your selection by clicking OK. Transit displays the Organise reference material window again. 4. Click on Start to begin the scan. 5. You now have the option to modify these scan results. – Clicking on the button to the right of the dropdown list allows you to exclude any subfolders in the filter window in question from the scan. By default, all subfolders are included in a search. This is indicated by the ‘normal’ (popped-out) appearance of the button’. Use the mouse to select the folder in the filter window whose subfolders you wish to exclude, and then click on the button to the right of the dropdown list. The button now has a ‘pressed-in’ appearance, and the subfolders of the selected folder will no longer be included in the scan results. When filter criteria are modified or subfolders excluded, Transit automatically updates the Scan results section. Therefore it is not necessary to restart the scan. 6. After you have achieved the desired search results, you can copy or move either individual files or all the files displayed in the Scan results section to another folder or delete the selected files. Select the files on which you would like to carry out these actions by clicking them with the mouse pointer. Hold the CTRL key at the same time if you wish to select several files from the list. – Click on Copy selected files to copy the selected files into a different folder. In the Select destination folder window, select the folder to which you wish to copy the files. Confirm your choice by clicking OK.
– Click on Move selected files to move the selected files into a different folder. In the Select destination folder window which then opens, select the folder to which you wish to move the files. Confirm your choice by clicking OK.
– Click on Delete selected files to delete the selected files from the Scan results list. How do I save search results? 1. Click on Save current results. Transit displays the Results file window. 2. Select the appropriate folder and enter a name for the file in the File name field. Click Save to confirm the information entered. 3. Transit saves the file in the folder containing the scanned reference material, or in another folder selected by you, with the name <Filename>.dat and then displays the Organise reference material window again. How do I load saved search results? 1. Select Reference material | Organise reference material. from the resource bar. 2. Click on Open results file. 3. Select the appropriate folder and the file and confirm your selection by clicking Open. Transit displays the Organise reference material window with the scan results loaded up. In Transit, you can search for any string in the reference material and have it replaced with another string – similar to the Transit editor. – Reference material – Transit searches the language pairs that are selected as reference material in the current project. – Working folder – Transit searches the language pairs located in the working folder of the current project. – Both – Transit searches both in the reference material and in the working folder of the current project. You can specify a minimum status that the segments must have to be included in the search. You can specify it for the reference material and the language pairs in the working folder separately. 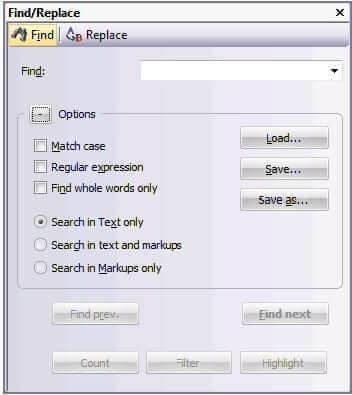 Phrase search – Specify if the search string must appear exactly in the order entered. Transit then automatically uses a similarity of 100%. Match case – Specify if you want Transit to take account of case. Minimum quality (%) – Specify how similar the search string and the text in the segments should be. This value is only relevant for word searches. If the Phrase search option is selected, Transit always searches for 100% matches. – Hide segments with this content – Transit searches only in segments without this segment content. – Only display segments with this content – Transit searches only segments with this segment content. This can be a word / phrase, a regular expression or a combination of the two. Specify if this restriction should apply to the target language or the source language. Additionally filter by access status section – Specify if Transit should only search segments that are permitted or not permitted as reference material. How do I search for and replace a string in the reference material? 1. Select Reference material | Modify reference material from the resource bar. Transit displays the Modify reference material window (Fig. 3-73). 2. Enter the search string in the Find field. 3. Specify whether to search the string in the target or the source language. 4. In the Replace with field, enter the string with which Transit replaces the string that is found. 5. Select the desired search and filter options. 6. Click Find all to start the search. On the right-hand side, Transit displays the content of the first segment found. To do so, select Next and Previous. To do so, select Replace. 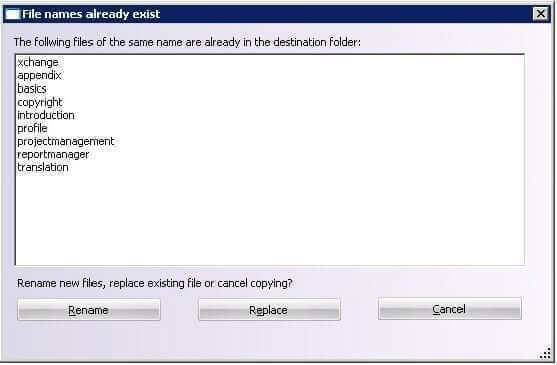 To do so, select Replace all. To do so, select Selected segment below Do not permit as reference material or Permit as reference material. To do so, select the desired file in the result list and click All Segments below Do not permit as reference material or Permit as reference material. To do so, click Save result list. 8. Save your changes at any time by clicking Save all language pairs. 9. When you are done, close the window by clicking Close. Language pairs which you create during translation in Transit can be used as reference material for other projects. These language pairs may contain many identical segments if, for example, tables or lists were translated with many segments that are identical, the ‘internal repetitions‘. Transit can compact your reference material so that it only contains a single copy of segments which occur multiple times or only differ slightly. This results in reference language pairs which are smaller in size and faster to transfer (e.g. by e-mail) and, in some circumstances, return faster pretranslations and fuzzy matches. If you are using reference material with different file types, Transit generates a separate file for each individual file type. Transit also divides files if they would contain more that 15,000 segments. This means that Transit is able to generate smaller, easily-managed files. Transit can create a project-related reference extract when it imports the project files. The reference extract only contains the reference segments which can be used when translating the project, and thus reduces the number of unnecessary reference segments. Transit can compact your reference material, regardless of which project it appears in. The compacted reference material only contains a single copy of any reference segments which occur multiple times, thereby reducing the number of identical reference segments. To create a reference extract, set the required options in the project settings (see section 3.6.18 “’Extracts’ project settings”) and import the project files (see section 3.7.3 “Performing an import”). How do I compact reference material? 1. Select Reference material | Compact reference material from the resource bar. – Click on Add projects if you want to compact the reference material of a certain Transit project. Transit opens the Project browser window. – Select the desired project and confirm your choice with OK.
– Select Add folder if you want to compact the Transit data in a particular folder. Transit opens the Select reference folder window. – Select the desired files and confirm the selection by clicking Open. – Select Add files if you want to compress particular Transit files. Transit opens the Select reference files window. – Select the desired files and confirm your selection by clicking Open. Transit displays the selected path in the Reference material field. 3. Specify the source language of the reference material: To do this, select the appropriate language from the Source language list. Transit requires this information to decide whether there are translation variants or not. 4. Specify where Transit should save the compacted reference material: To do so, click on … to the right of the Filename field. In the Reference extract window, select the drive and folder and enter a filename. Confirm your selection by clicking Save. This setting may be useful, as Transit can partially pretranslate segments with differing numbers and then carry over the numerical values from the current segment (see the paragraph “Details”). This would make otherwise identical segments with different numbers superfluous. This setting may be useful, as Transit can partially pretranslate segments with differing fonts and then carry over the fonts from the current segment (see the paragraph “Details”). This would make otherwise identical segments with different fonts superfluous. This setting is relevant if there are different translations for the same source-language segments. Do not check this option if you do not want the compacted reference material to contain variants. The compacted reference material will then contain one copy of each source-language segment with one translation. Select this option if you want the compacted reference material to contain all the variants. The compacted reference material will then contain multiple identical source-language segments, each with one translation version. Select this setting if you want Transit to also save the corresponding context information along with segments whose content is identical but that differ in terms of their structure information (for example, if the same text appears once as a table heading and another time as a list point). 6. Once you have verified all the options and made any necessary changes, compact the reference material by clicking Start. Transit displays the Reference extract window. The progress bar indicates what percentage of the reference material has already been compacted. 7. Click Details if you want to view the statistics on the compacted reference material. Transit displays the Details window with statistics on the compacted reference material. – Click Save if you wish to save these statistics. In the Save log as window, enter the drive, folder and filename for the log file. Click Save to confirm the information specified. Close the Details window by clicking OK.
Close the Reference extract window by clicking OK.
8. Close the Compact reference material window by clicking Close. Transit has compacted the reference material. You can now use it as reference material for your projects. Transit can also import data created by other Translation Memory systems. Equally, you can export Transit language pairs to allow this data to be edited in another environment. This happens through the TMX data interchange format. More details on exchanging data via TMX can be found in the Transit/TermStar NXT Reference Guide, chapter 2 “Exchanging reference material via TMX”. You may have reference material which was not translated in Transit and you only have in the original file format. However, Transit is only able to use translations as reference material if they are in the Transit format. An alignment project makes it possible to import source-language documents and their translations into Transit. Alignment is then carried out, and this generates Transit language pairs which can be used as reference material for other projects. You can create an alignment project from the resource bar by selecting Reference material | Alignment | Create alignment project. You can find more detailed information about creating alignment projects in chapter 2 of the “Transit NXT Alignment Tool” manual. Open the project browser by selecting Reference material | Alignment | Project browser. Only alignment projects will be displayed here, if any are available. To open a standard project, select Project | Administration | Open. Transit NXT can also use reference material from Transit XV projects by converting them. How do I convert Transit XV reference material to Transit NXT? 1. Select Reference material | Convert Transit XV reference material to Transit NXT from the resource bar. 2. Specify the folder where the Transit XV reference material is located. To do this, click on the … button to the right of the Folder for Transit 3.0/XV reference material field. Transit displays the Folder for Transit 3.0/XV reference material window. 3. In this window, select the drive and folder for the reference material and confirm your selection by clicking Open. Transit displays the selected folder in the Folder for Transit 3.0/XV reference material field. When a folder is selected, Transit also takes account of any data contained in subfolders. 4. If you know it, you should now specify the source language which Transit should use as the basis for the reference material conversion. To do this, select the appropriate language from the Source language list. If you do not know the source language, select the — option. In this case, Transit will determine the source language based on the timestamp for the individual segments, i.e. it will select the language where a majority of the segments have an older timestamp as the source language. Example: a folder which is to be converted contains language pairs for English and French. If the “—“ option is selected, Transit will compare the timestamp for the French and the English segments. If it turns out that, for example, the French segments have an older timestamp in 67 percent of cases, Transit will select French as the source language. 5. Specify where Transit should save the converted reference material. To do this, click on the … button to the right of the Destination folder field. 6. In the Destination folder window, select the drive and folder and confirm your selection by clicking Open. Transit shows the path for the folder in the Destination folder field. 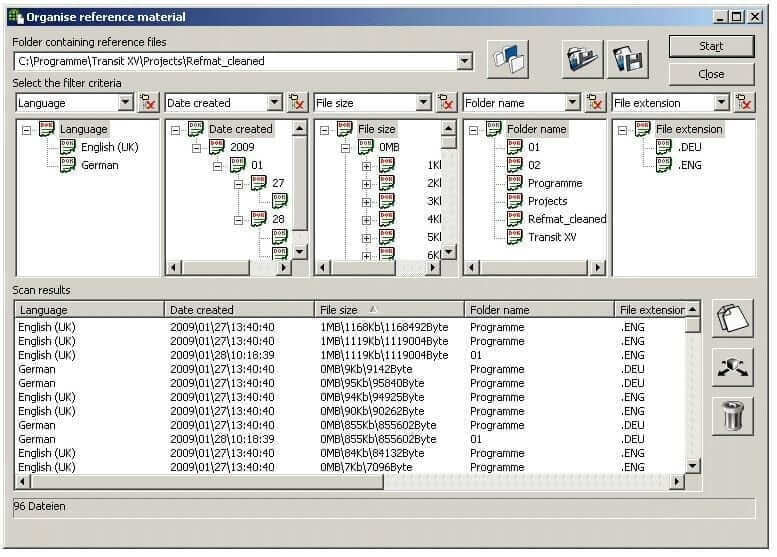 The folder structure of the converted reference material in this folder will match that of the selected Transit XV reference-material folder. 7. Now you can start the reference material conversion process by clicking Start. 8. Close the Reference material conversion window by clicking OK.
9. Close the Convert reference material to Transit NXT window by clicking Close. Transit has converted the Transit XV reference material. You can now use it as reference material for projects in Transit NXT. To enable Transit to interpret user-defined file formats, the ffd file (*.ffd, file format definition) must be present in the config\sys folder of your Transit installation. If this is not the case, copy the required ffd file into this folder. 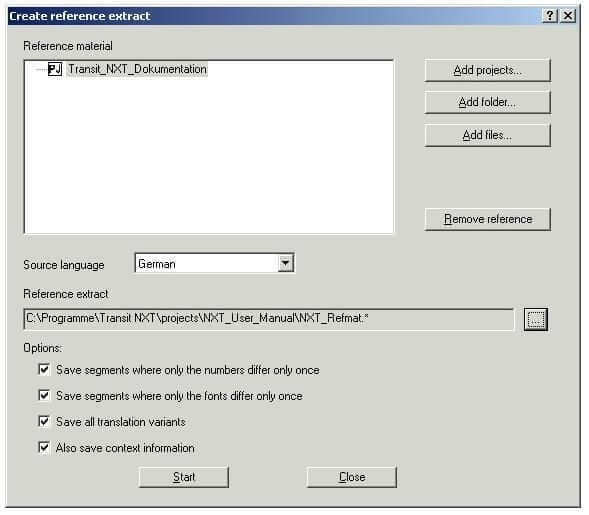 If you are using reference material converted from Transit XV to pretranslate in Transit NXT, it will not be possible for certain markups to be assigned automatically (for information on this, see section 6.5.3 “Markups in converted reference material”). A Dual Fuzzy search on your translation memory gives you more choice and reference. You can search in both source and target segments across your project – seeing how and where terms have been used before and in different contexts. This can improve your understanding of key terms and ensure consistent translation. Transit uses the Fuzzy index to suggest translations from existing translations (fuzzy matches). One innovation for fuzzy search which appears in Transit is the so-called Dual Fuzzy principle – ‘dual’ because Transit can search for matching blocks of text both in source-language and target-language segments. If no match is found in the source language, Transit can search the target-language segments for similar text while you type your translation. If Transit finds segments containing similar target-language text, these are displayed in the red Target fuzzy window, in accordance with the concept of colour-coding employed in Transit. Target-language fuzzy search is a particularly valuable tool for the translator when source-language segments which convey the same message are written in a slightly different way, meaning that no matches are obtained using source-language fuzzy search. When it comes to the target language, however, there may well be segments with the same content as the text being translated. 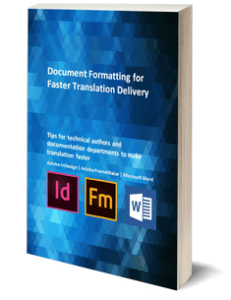 Using these target-language translation suggestions, the translator is able to ensure the consistency of the text by formulating identical content in exactly the same way. Another feature of the target-language fuzzy search is that it also makes it possible to remove variations in the source language, thus allowing a higher level of consistency to be attained in the original documents as well. For information on how to build the fuzzy index and how to edit and accept translation suggestions, please refer to section 2.“Building the fuzzy index and accepting suggestions. First line – Match quality, icon and file containing the translation suggestion. Clicking the icon opens the reference file in a separate window. Icon – The reference segment has the same source and target language as the current segment. Icon – The reference segment has the reverse source and target language in comparison to the current segment. Icon – The source and the target language of the current segment were both target languages in the project the reference segment origins from. Icon – The reference segment has been translated via a Pivot language. This information is especially of interest if you often work on multilingual projects. Please consider that this information can be displayed only, if the reference files you use come from projects that were created with Transit NXT Service Pack 7 or newer. By default, Transit highlights source-language differences between the reference segment and the current segment using a thin green line. You also have the option to display the differences using a thick line or with different font colours. To define these colours, click on the Transit button and select User preferences, then click Colours and fonts in the window and select the colour which Transit should use in these circumstances. This line displays the reference segment exactly how it appears in the reference file. The symbol in the second column provides information on which status the reference segment has (e.g. 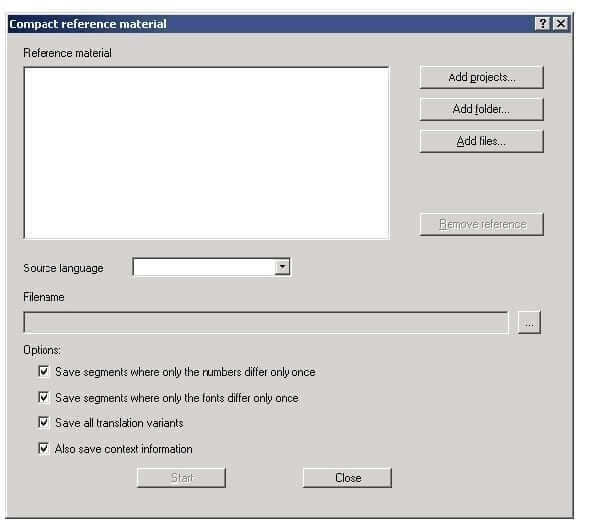 ‘+’ for 100% match or ‘#’ for a segment which was originally pretranslated with the status Check pretranslation (for information, see “Display of the segment status in the Transit editor”). This line displays modifications which may be required to the target-language segment (numbers, markups, etc.). Any modifications compared to the unaltered reference segment displayed in line 4 are represented by the numbers in the left-hand field. For example, if the indicator shows 2/1/0/0, this therefore means that in the updated segment, numbers and markup information have been altered to match the information in the active source-language segment. Press NUM + (numeric keypad) to display more fuzzy matches. In such a case, you can switch back and forth between the different suggestions using the PLUS and MINUS keys (numeric keypad). Transit builds the fuzzy index if you accept a translation with ALT+INS or a translation suggestion using ALT+ENTER. At the same time Transit creates and updates the fuzzy index in the background such that you do not need to wait for suggestions while you are translating. Transit saves the fuzzy matches in a temporary memory so they can be displayed in seconds. Transit displays the translation suggestions (fuzzy matches) it has found in the Source fuzzy or Target fuzzy windows (fig. 5-22). To check the context, you can open the reference file containing the fuzzy match. To do this, double click on the icon in the first column to the left of the path for the reference file. Alternatively you can also open the reference file via the context menu. You can also use this function to correct errors in the reference material if necessary. To make working with fuzzy matches as flexible as possible, Transit offers you two different window types. You have the choice between using fixed fuzzy windows or bubble windows to display fuzzy matches. Both window types contain the same basic information. However, they differ in terms of how they are used. This is described briefly in the following. The bubble window opens at the segment in the target language containing the cursor. When the bubble window opens, the cursor stays in the target-language segment. This offers you the opportunity to accept the translation suggestion straight into the target-language segment and to adapt it from there, if necessary. The fixed fuzzy windows are either docked to the Transit user interface, wherever you have selected, or configured as floating windows. When a fuzzy match is displayed in one of the fixed fuzzy windows, the cursor appears in the fuzzy window at the start of the line containing the updated translation suggestion. This offers you the opportunity to adapt the translation suggestion in the fuzzy window, if necessary, and then to accept the translation into the text. 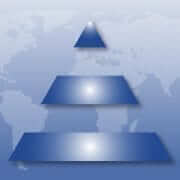 – Pressing ALT+INS adopts the unchanged translation suggestion into the target language segment. Transit automatically assigns the segment the status that is to be assigned in accordance with the default setting (e.g. Translated or Checked 1) and moves the cursor to the next untranslated segment. If there are a number of translation suggestions for a segment, Transit automatically adopts the first proposal from this list. If another translation suggestion from the list is to be used, you have to position the cursor manually in the line of the desired translation suggestion. Insert this suggestion in the target language segment by pressing ALT+INS. You can prevent the ALT+INS function from adopting the translation suggestion by changing the user preferences. Please refer to section 5.4.3 “Dual Fuzzy – User preferences” for more detailed information on this topic. 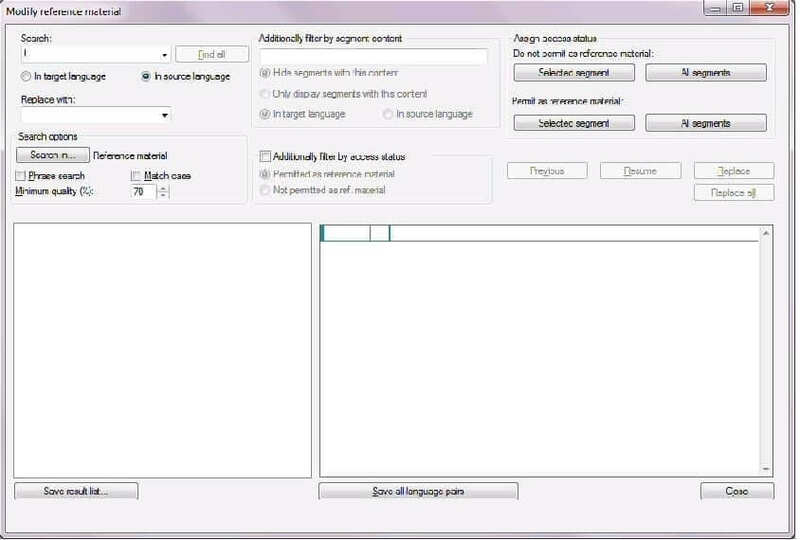 – ALT+ENTER inserts the unchanged translation suggestion into the target language segment, but it is not automatically assigned the status Translated. You have the possibility to edit the translation and then confirm it by pressing ALT+INS. If you are checking a translation in Transit, it is recommended to use the bubble window and to disable the fixed fuzzy window if necessary. You can hide bubble windows by pressing the ESC key and then confirming the current segment by pressing ALT+INS. If the fuzzy index is started via the fixed fuzzy window, you have to position the cursor in the target language segment manually for each fuzzy match before you can confirm this segment with ALT+INS. You can find information on the Dual Fuzzy settings in section 3 “Dual Fuzzy – User preferences”. How do I search for fuzzy matches and use suggestions in my translation? – Press the keyboard shortcut ALT+ENTER to search for source-language fuzzy matches for the active segment. Transit searches for fuzzy matches for the active segment and displays them in the Source fuzzy window. – Press the keyboard shortcut ALT+INS to confirm the segment selected in the target language as ‘Translated’ and to move the cursor to the next segment to be processed. Transit moves the cursor to the next segment to be processed and searches automatically for source-language fuzzy matches in this new segment. These are then displayed in the Source fuzzy window. – To confirm the active segment, press the shortcut ALT+INS. Transit moves the cursor to the next segment to be processed. When you have entered more than two words into this segment, Transit starts a target-language fuzzy search. Transit displays the matches in the Target fuzzy window. Depending on the user preferences, Transit can automatically insert the suggestion from the fuzzy index into your translation or display it in the fuzzy window as a suggestion, allowing you to check and, if necessary, adapt it (see section 5.4.3 “Dual Fuzzy – User preferences”). – You can alter the translation suggestion from right inside the respective fuzzy window to adapt it to fit with the current translation. To do this place the cursor in the line containing the translation suggestion and modify it. – Using the PLUS and MINUS keys on the keypad, you can switch back and forth between translation suggestions, if Transit has found several suggestions. – You can check the context of a translation suggestion by opening the reference file where the translation suggestion can be found. Click on the X at the top right of the editor area to close the reference file again. This is gives you the option to decide whether the cursor should move to the reference segment. 3 Transfer the match (which you may or may not have altered) to your translation. Press the ALT+ENTER keyboard shortcut to do this. Transit replaces the target language segment with the suggested translation and places the cursor in this segment. If you do not wish to accept the fuzzy match, switch back to the target-language window to translate the text there on your own. To do this, press the keyboard shortcut ALT+2 or place the cursor in the target-language pane using the mouse. 4 Now confirm the selected segment as ‘Translated’ and move the cursor to the next segment to be processed. Press the ALT+INS shortcut to do this. Transit moves the cursor to the next segment to be processed and looks for fuzzy matches there. In the user preferences, you can define how high the quality of translation suggestions should be and how Transit should accept translation suggestions, independent of a specific project. How do I configure the user preferences for Dual Fuzzy search? 2 Select Dual Fuzzy from the list on the left. You can also open that window via the Dual fuzzy button in the resource bar. – Under Minimum status, you can define from which segment status reference matches should be regarded. If you do not specify a minimum segment status for the source-language fuzzy search, Transit will suggest all segments, regardless of the segment status. These may also be segments in which only terms from the dictionary have been accepted but not the rest of the segment. To prevent Transit from displaying such segments as translation suggestions, specify a minimum segment status for the source-language fuzzy search (e.g. Translated). Now Transit will only suggest the segments that you confirmed, e.g. as ‘Translated’. – Under Minimum quality (%), you can specify the minimum quality of the fuzzy matches which Transit suggests. To do this, enter the desired value. – Select the Bubble option if you want fuzzy matches to be displayed in a bubble window. – Select the Fixed window option if you want fuzzy matches to be displayed in the fixed window. Numbers – If this option is selected, any changes to numbers will be updated and the modified segment accepted into the translation. Markups – If this option is selected, any changes to markups will be updated and the modified segment accepted into the translation. User-defined exceptions – If this option is selected, fuzzy matches containing a user-defined exception will be updated and the modified segment automatically accepted into the translation. Terminology – Transit uses this function if the source-language reference segment and the segment to be translated only differ by one word. If Transit finds both words (old and new word) in the project dictionaries, it automatically uses the translation for the new word from the dictionary. ENG reference segment: There is a bird in the garden. DEU reference segment: Da ist ein Vogel im Garten. ENG active segment: There is a raven in the garden. DEU active segment: Da ist ein Rabe im Garten. – Using the option Display updates as, you can select how update markers should be displayed in the fuzzy window. The relevant selection applies both to the Source Fuzzy and the Target Fuzzy window. Thin lines – Updates are identified using thin lines – in the source language segment, the lines are green, and in the target language translation suggestion, they are red. Thick lines – Updates are identified using thick lines – in the source language segment, the lines are green, and in the target language translation suggestion, they are red. Font colour – Updates are identified using preset font colour. If necessary, you can adjust these colours to suit your individual requirements, in the Colours and fonts user preferences. – Using the Show icon for language direction option you can specify that the icon indicating the language direction is no longer displayed in the Fuzzy window in case you do not need this information (see info box “Icon for language direction of the reference segment”). – The option Automatic segment concordance search if no fuzzy match is found automatically performs a concordance search if a fuzzy search does not produce any results. Under Minimum quality (%), specify the minimum percentage match that Transit should take into consideration for the concordance search. Thus Transit will only suggest matches where the reference segments and the segments to be translated exhibit the specified level of similarity. – Using the option Use ALT+INS to accept fuzzy match and to confirm segment as translated, you can specify that shortcut ALT+INS should cause Transit to accept the fuzzy match from the fuzzy window and confirm the current segment, all in a single step. If this option is deselected, Transit will not accept the fuzzy match when ALT+INS is pressed. In this case, it is first necessary to accept the fuzzy match using the shortcut ALT+ENTER, and then confirm it using ALT+INS. If segment concordance search is selected and a match is returned, the Alt+Ins function is initially disabled. However, as soon as you have modified the match in the fuzzy window, the Alt+Ins function can be used. – Select the Automatic search option if you want Transit to automatically start a search in the target language whenever the source-language fuzzy search produces no results. – Select the Phrase search option if you want to search for the precise sequence of words in the target-language fuzzy search. – Below Search in you can select if Transit should search both the Reference material and the Working folder during the source-language fuzzy search. – Click on OK to confirm the changes and close the User preferences window. – Click on Save to confirm the settings without closing the window. This allows you to make further changes to the user preferences. Via the ribbon bar, you can configure additional fuzzy search options. To do this, select Matches | Fuzzy search (source) or Fuzzy search (target). Here you can define from which segment status reference matches should be regarded. The Source fuzzy window only suggests translations with at least the selected status. Transit automatically inserts suggestions from the fuzzy index into the target-language text if the match is 100% (i.e. reference segment and segment to be translated match exactly). Always – The 100% match is accepted automatically. If no variants exist – If this option is selected, the 100% match will only be accepted if the reference material only contains a single possible translation. If several variants exist, Transit will show you all the translation variants as fuzzy matches. Never – The 100% match is not accepted automatically, but rather only displayed as a suggested translation. This is the default. Here you can define the minimum quality level of the fuzzy matches suggested by Transit. Enter the desired value. Thus Transit will only suggest fuzzy matches where the reference segments and the segments to be translated exhibit the specified level of similarity. If you select this option, Transit will carry out a concordance search in the source-language segments if the fuzzy search returns no matches. With this option, you can specify how Transit should update the fuzzy matches. You can find information on the possible settings in section 5.4.3 “Dual Fuzzy – User preferences”. Bubble – Select this option if you want fuzzy matches to be displayed in a bubble window. Fixed window – Select this option if you want fuzzy matches to be displayed in a fixed window. Automatic search – Selecting this option will mean that the fuzzy search starts automatically, during translation, without the need to press the ALT+ENTER shortcut. Match case – If you select this option, a 100% match will only be automatically accepted if there is no discrepancy in capitalisation in the segment to be translated and the reference segment. If this option is not selected, then the fuzzy search will not distinguish between upper and lower case. – On/Off – Clicking on this button switches the automatic target-language fuzzy search on or off. 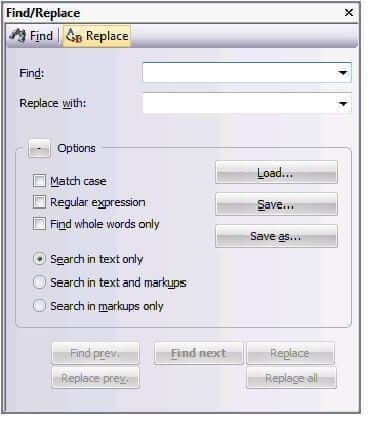 Reference material – If this option is selected, the reference material will be searched for fuzzy matches. Working folder – If this option is selected, the working folder will be searched for fuzzy matches. Phrase search – If this option is selected, Transit will search for the precise sequence of words in the target-language fuzzy search. In this guide we show you how to get the most from Transit by showing some of the key features and shortcuts. As translators ourselves we’ll show you how we use Transit and the advanced features of some of the core functions. Having read this – you will learn how to make your translation easier. In Transit, as with every word processing program, you can search for any string. Transit displays various messages if it cannot find the string you are searching for (see Table 5-10). How do I search for a string? 1 Place the cursor in the window in which you wish to search. Select the string that you want to find. 2 Select Processing | Search | Find. 3 Enter the search string in the Find field. If you have selected the string previously, it is automatically inserted in the Find field. 4 To set additional options for the search, click on the + button in the Options section. – Match case – Select this option if you only want Transit to find strings which precisely match the case of the character string entered in the Find field. – Regular expression – Transit will interpret the string as a regular expression. Please refer to the Transit/TermStar NXT Reference Guide for details on regular expressions. – Find whole words only – Select this option if you want Transit to search for strings as whole words and not as a part of another word. – Search in text only – Transit will only search in the text, not in the markups. – Search in text and markups – Transit will search both in the text and in the markups. – Search in markups only – Transit will only search in the markups, not in the text. – Load is used to call up a saved search. – Save is used to save the current search. – Save as is used to save a loaded search under a different name. – Count informs you on how often the search string occurs in total. – Filter displays only the segments that contain the search string. By clicking Filter off you can switch off the filter again. – Highlight all occurrences of the search string in green. By clicking Highlight off you can switch off the highlighting again. 6 Click Find next or Find previous to search for the string. Transit searches for the string. Transit highlights the string it has found or displays a message. 7 You can now proceed either by clicking on Find next or Find previous or by entering a different string and searching for that. – If you no longer require the Find/Replace window, you can close it by clicking on X on the right of the titlebar. – It is also possible to integrate the Find/Replace window with the user interface by docking it. In Transit, as with any other data processing program, you can search for any string and have it replaced with another string. Transit displays various messages for you to respond to if it cannot find the string you are searching for. How do I find and replace a string? 1 Place the cursor in the window in which you wish to perform the find/replace operation. 2 Select Processing | Search | Replace. 4 In the Replace with field, enter the string which Transit will use to replace any instances it finds of the specified string. 5 To set additional options for the search, click on the + button in the Options section. – Match case – Select this option if you only want Transit to find and replace strings which precisely match the case of the character string entered. – Load is used to call up a saved find/replace operation. – Save is used to save the current find/replace operation. – Save as is used to save a loaded find/replace operation under a different name. 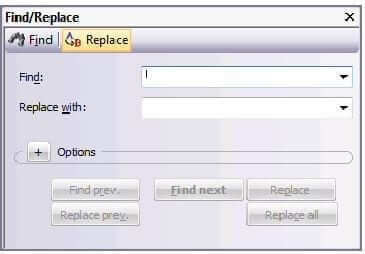 – To replace the string found, click on Replace or Replace previous. Transit replaces this string and continues the search forwards or backwards. – If you do not want to replace the string it has found, click on Find next or Find previous. Transit leaves this string unchanged and continues the search forwards or backwards. – If you want to interrupt or exit the process, click on X. Transit closes the Find/Replace window. 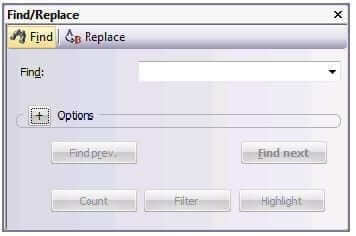 – If you want to replace all strings found without further prompting, click on Replace all. Transit will replace this string, then continue the search and automatically replace all the other matching strings it finds. After this, Transit displays a message with the number of strings found and replaced. Transit displays various messages similar to those seen in the Find function if it cannot find the string you are searching for. 8 If you no longer require the Find/Replace window, you can close it by clicking on X on the right of the titlebar. In Transit you can delete text in the usual manner with the BACKSPACE or the DEL key. However, it is also possible to quickly delete the text in question using the Delete to end of segment option. This can be found under Processing | Translate. The dropdown menu from the Confirm button allows you to select or deselect this option. When it is selected, Transit will automatically delete the source text (underlined in red) when the user presses the ALT+INS shortcut. If there are markups you wish to delete in the text, Transit will delete these as well. Markups in the other segments are not affected by this. You can move or copy text in Transit with the mouse. How do I move or copy text with the mouse? 1 Select the text you want to move or copy. – To move the text you have selected, hover the mouse pointer over the selected text, then press and hold the left mouse button. Then drag the text with the mouse to the position where you want to insert it. – To copy the text you have selected, press and hold the CTRL key and drag the highlighted text to the position where you want to insert it. Using the Character map option in Transit, you can insert any Unicode character which can be represented by the current character set. In doing so you can choose from various character groups. 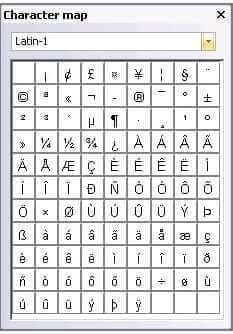 How do I insert a Unicode character? 1 Place the cursor at the position where you want to insert the Unicode character. 2 Select Edit | Text | Character map. 3 Select a Unicode character group from the list (e.g. Latin-1). Transit shows the characters from the group selected in the character map. 4 Click on a character to insert it at the cursor position. Transit inserts the character at the cursor position. The window remains open so that you can insert more Unicode characters. 5 If you no longer require the Character map window, you can close it by clicking on X on the right of the titlebar. – It is also possible to integrate the Character map window with the user interface by docking it. 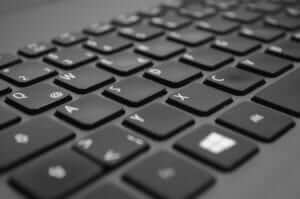 You may have defined several so-called input languages in Windows to make it possible to enter text in different languages using the respective keyboard layout. In such a case, Transit automatically selects the correct keyboard layout for each window and each dictionary entry. When the cursor is in the source-language pane (German), Transit selects the German keyboard layout. When the cursor is in the target-language pane (English), Transit selects the English keyboard layout. When the cursor is in a German dictionary entry, TermStar NXT selects the German keyboard layout. When the cursor is in an English dictionary entry, TermStar NXT selects the English keyboard layout. This must be enabled by selecting the appropriate setting in the Windows Control Panel (for example, in Windows 7, from the Start menu select Settings | Control Panel | Regional and Language Options, Languages tab, then the Details button). This change will apply until the next time Transit selects the language automatically. You can use the Windows keyboard shortcuts to switch between the different languages. By default, Windows uses the keyboard shortcut ALT (left) + SHIFT. You can change this shortcut in the Windows Control Panel. 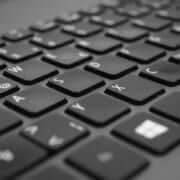 – You can deselect the Automatic keyboard switch option under Edit | Miscellaneous. 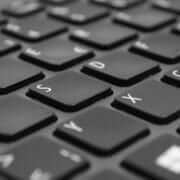 Please refer to section 8.3.18 “Activating/deactivating automatic keyboard-layout switching” for more detailed information on this topic. – Remove any languages which you do not require. Transit can only switch between languages that you have added. You can move the cursor in the editor with ribbon bar commands or keyboard shortcuts. The next table shows the ribbon bar commands for moving the cursor and the relevant shortcuts. If you are working in internal repetitions mode, Transit provides other possibilities for moving the cursor. You will find the number of the segment in which the cursor is located in the column on the left-hand side of each of the editor panes and in the status bar at the bottom of the window (Seg. : ). You can find more detailed information on this here. You will find the number of the line in which the cursor is located in the status bar at the bottom of the window (Line. : ). You can find more detailed information on this here. If you have the Formatting or Structure options – for ‘WYSIWYG’ display of formatting and document structure – selected under View | Text/Markups | Options, the line number is not displayed. You can bookmark text in the Transit editor so you can move the cursor quickly to the bookmarked text. The bookmarks can be deleted if you no longer need them. Transit automatically removes bookmarks during export so there are no “Transit-related” marks in the target-language original format. You have the option to set a flag in the text so that Transit can ‘memorise’ a particular position in the text. After you have checked something at a different location, you can easily find your way back to the flagged position in the text. How do I move the cursor to a segment or to a line? – Line – If the Formatting or Structure options are selected for ‘WYSIWYG’ display of tables and structure, this option is not available. – Bookmark – If you have set a bookmark, Transit can move the cursor to the bookmark. 2 In the field to the right of the dropdown, enter the number of the segment, line or bookmark to which you want to move the cursor. 3 Click on Go to or press the ENTER key. Transit moves the cursor to the selected position. The cursor does not move if you enter an invalid value. How do I set a bookmark? 1 Move the cursor to the position at which you wish to set a bookmark. 2 Under Edit | Text, click on the Bookmark option. 3 Enter a number for the bookmark. Using this number, you can go to this position via the Processing | Search | Go to option. 4 Click Set to confirm the settings. Transit sets the bookmark at the cursor position. How do I delete a bookmark? 1 Select Edit | Text | Bookmark. Transit displays the Bookmark window. 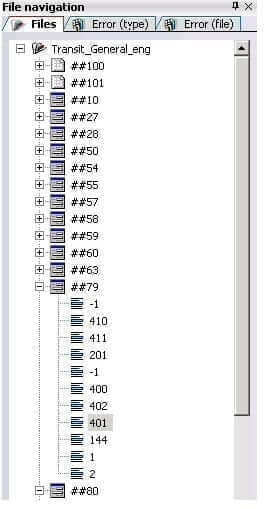 2 Enter the number of the bookmark you want to delete. 3 Click Delete to delete this bookmark. Transit deletes the bookmark specified. How does Transit retain the current position of the cursor? 1 Move the cursor to the position Transit should retain. Transit notes the position. You can now move the cursor to another position. Transit only retains the position as long as the language file is open. Transit will no longer be able to find the position if you close the language file and open it later. How do I jump back to the retained position? Transit moves the cursor to the retained position. In addition to being able to assign markups to translated text in Transit, you can also manually assign bold, italic or underline font attributes to the font style. In this case, Transit does not use the character formats that may have been assigned in the source file or format templates. 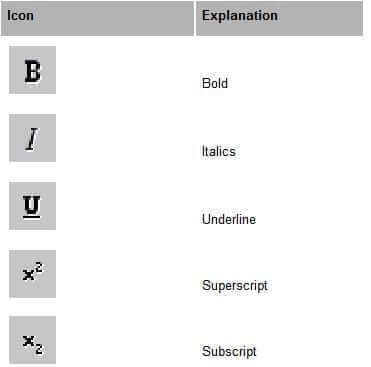 Instead it only assigns the bold, italics or underline font attributes. This means that you can format a word more quickly if, for instance, a word is marked with quotation marks in the source language and you wish to mark it in bold in the target language. Manual formatting or update markups? In various programs (e.g. 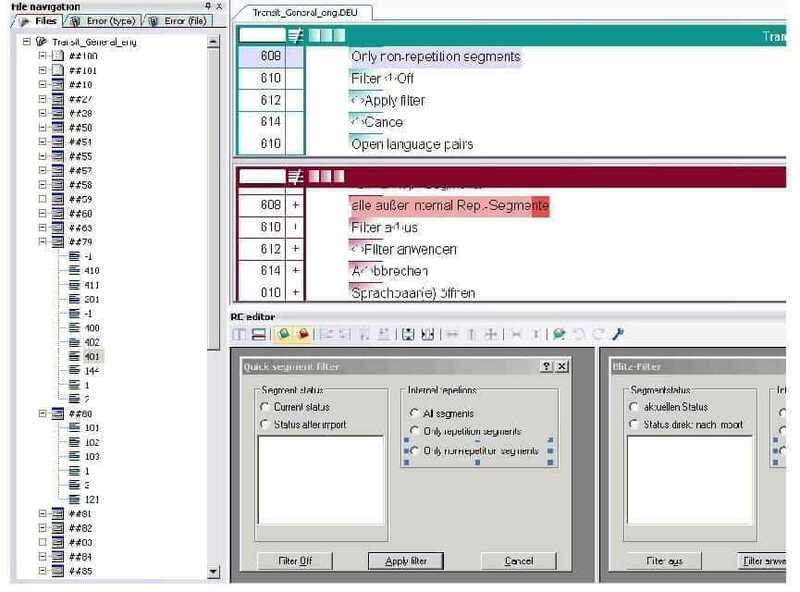 Word, FrameMaker), it is possible to specify so-called “Character formats”, “Character templates” or “Format templates” for the character formatting. Transit uses markups instead of these formats. If you format the text manually, Transit does not use these markups, but rather assigns the desired attribute to the text (e.g. underline or bold). For this reason, where applicable, you should ask your customer to confirm how the text should be formatted before formatting the text. How do I format the text manually using formatting commands? 1 Highlight the text that you wish to format. Transit assigns the font style to the highlighted text and inserts the appropriate markups. The appearance of markups in the Transit editor is dependent upon the settings selected under View | Text/Markups. The text in the source language is always write-protected so that you do not inadvertently change the text. If this happened, the language pair would no longer agree with the imported source document and you would be unable to use your translation as reference material. However, it may be necessary to change the text in the source language in certain cases – if you have found typing errors in the original document, for example. It is recommended that you reactivate write protection for the source language as soon as you have made your changes. In this way you can avoid the source language text being changed accidentally. How do I deactivate write protection for the source language? 1 Place the cursor in the source-language text. 2 Uncheck the Read-only option under Edit | Text. Transit deactivates write protection for the source language. 3 Correct the errors in the text. We recommend you reactivate write protection immediately afterwards. How do I reactivate write protection for the source language? 2 Click on Read-only under Edit | Text. Transit reactivates write protection, as indicated by the checkmark in front of this option. 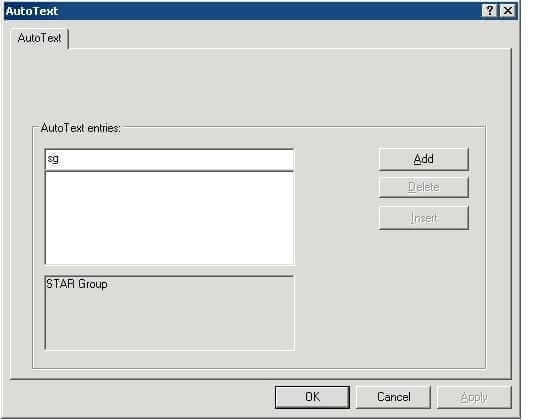 Instead of the text itself, you enter the name of an AutoText entry into the editor; Transit then automatically inserts the required text. Example: The expression STAR Group occurs repeatedly in your text. You save these words as an AutoText entry and specify sg as the name of the entry. Then all you have to do is enter sg and Transit will replace the string with the expression STAR Group. Transit displays the names of all the expressions you have saved as AutoText entries in one window. You can select the desired entry from this list, then Transit will enter it into your translation. How do I create an AutoText entry? 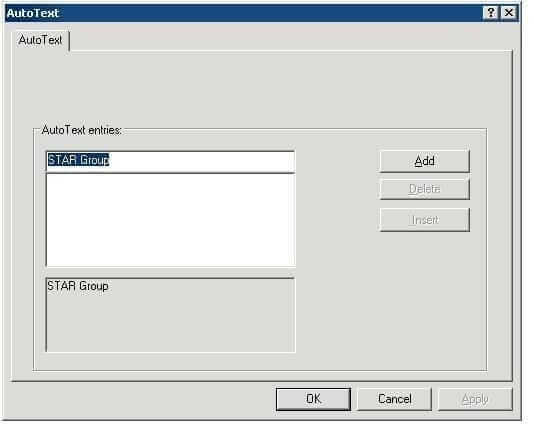 1 Select the text in Transit you want to save as an AutoText entry (in the example, STAR Group). 2 Select Edit | Text | AutoText. – top field – Name of AutoText entry. The top field initially displays the text you selected as the name for the AutoText entry (in the example, STAR Group). – middle field – List of names of all available AutoText entries. – bottom field – Text which Transit should insert as AutoText (in the example, STAR Group). You can enter this name in your translation instead of the text itself (in the example, sg). Transit automatically replaces the name with the AutoText. 4 To confirm your entry, click Add. Transit will use the specified name as an abbreviation for the text displayed in the bottom field. Transit now also displays the name string in the centre field. Transit saves AutoText entries on a user-related basis at \config\users\\ in the file default.prf. 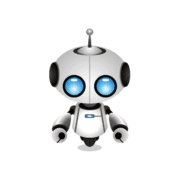 An AutoText entry appears in this file below [AutoText] as soon as you open the User preferences window and click Save. How do I enter AutoText while translating? 1 Enter the name of the AutoText entry in the target-language window (in the example, sg). 2 Immediately press the F3 key to make Transit replace the name with the AutoText (in the example STAR Group). How do I select an AutoText entry from the list? 1 Place the cursor in the target-language window at the point at which Transit should insert the AutoText. Transit displays the AutoText window with its three fields. The centre field displays the names of all the AutoText entries saved. 3 In the centre field, select the name of the AutoText entry which Transit should insert into your translation. Once you select a name, the bottom field displays the AutoText which will be inserted into the translation. 4 Click Insert to insert the text into your translation. Transit enters the saved AutoText into your translation at the cursor position. How do I delete an AutoText entry? 1 Select Edit | Text | AutoText. 2 In the centre field, select the name of the AutoText entry which you want to delete. Once you select a name, the bottom field displays the AutoText which belongs to the selected name. 3 Click Delete to delete the AutoText entry. Transit deletes the AutoText entry. 4 Close the AutoText window by clicking OK. The languages files within a project are normally opened via Project | Administration | Open language pair or via the Quick Access Toolbar. Transit offers a further possibility with the File navigation floating window. The Files tab in this window provides a separate view of all the files contained in a project and their hierarchy, and also allows you open these files in the Transit editor right from the window with a double click. Navigation via the File navigation window is of particular use when working with resource files. Clicking on a dialog name or a particular element in the tree structure displayed in this window takes you directly to the corresponding segment in the Transit editor. In addition, the File navigation window contains the Error (type) and Error (file) tabs that serve as error display. This error display is updated when a format check or terminology check or a an error report via the Report Manager Quality Check is performed. The RC editor is a tool for localising resource files. It offers a comprehensive set of options for working with binary resource files, for example, for resizing and repositioning the window elements contained within these files. In the RC editor, you can alter the size or position of a window element, or select several elements at once to arrange them on the interface, as required. In addition, the Markup window allows you to check which letters you have already used for accelerator keys in the current translation, thus avoiding accelerators being assigned multiple times. The File navigation window provides you with a separate view of the files in the project and can also be used to jump to specific dialog names or window elements. For information on how to select and show the viewers, please refer to the instructions under “How do I select a viewer?”. How do I group and edit multiple window elements? 1 Click on the first window element you want to add to the group. The element is highlighted with blue resizing handles. 2 Press and hold the CTRL key. 3 Add other elements to the group by clicking on them. 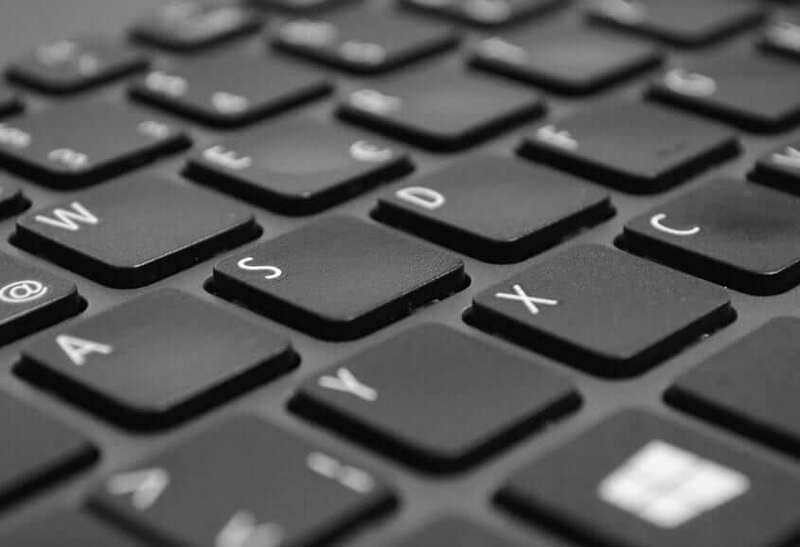 If you press the SHIFT key, instead of the CTRL key as described in point 2, the first element selected will determine the dimension in question for all the elements in the group. This element can be identified by the blue resizing handles. 4 Now select the desired function from the RC editor toolbar to alter the size and position of the grouped window elements. If in resource DLLs on WPF basis the automatic size adjustment of UI elements (AutoResize) was set, this is also taken over for the localisation and display in the RC editor, i. e. the size of the elements is automatically adjusted to the text lenght. The circumstance that the height and width of elements cannot be replaced by user-defined values, is in this case volitional. How do I handle a translation project in the RC editor? 1 Open or unpack the project. 2 Move the mouse pointer over the resource bar and select the File navigation window from the context menu. Transit shows the File navigation window. 3 If necessary, also call up the RC editor window and the Markup window using the method described in point 2. If you often work on projects containing binary resource files, it is recommended that you select the appropriate user role or set up a window layout which is suited to this purpose. 4 In the File navigation window, double click on the binary resource file you would like to edit. Please note that this is the only way to individually select window elements. Opening language files via the ribbon bar or the Quick Access Toolbar displays the first segment of the opened file in the Transit editor. Transit opens the selected language file in the Transit editor. – If the length restriction is exceeded, the text in the segment is highlighted in light and dark red. The section of the text highlighted in dark red is the part which surpasses the length restriction . 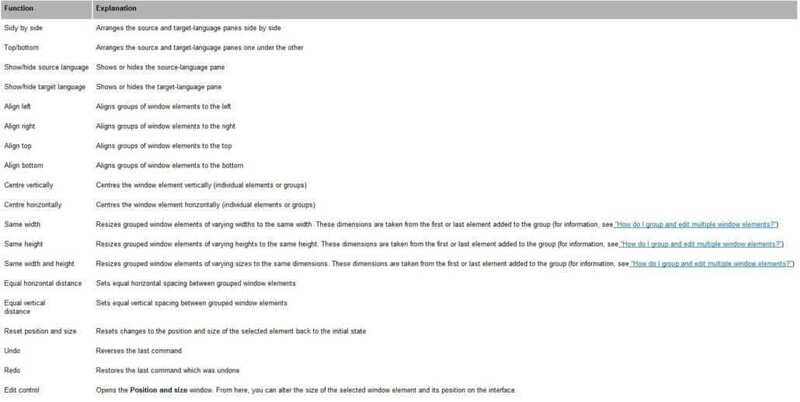 – If it is necessary to change the position or size of window elements, proceed as described in the section “How do I group and edit multiple window elements?”. – The process for handling and inserting accelerator keys is the same as that used for handling markups. The accelerator key is indicated by a superscripted 1 to the left of the selected letter. In addition, the Markup window indicates which letters have already been used as accelerators in the translation of the current window or menu. This information in the Markup window is only for information purposes. After your translation is complete, you can carry out a check for unassigned accelerator keys via markup mode or format check. The check for accelerators which have been assigned more than once can only be carried out via the format check. Using the shortcut CTRL+SHIFT+ you can define accelerator keys in the target language which have no equivalent in the source language. This may be useful if an accelerator is missing in the source language, but needs to be inserted for the target language. 6 Continue with the process described under point 5 until you have finalised the translation. Happy New Year to all our clients doing business with China. The Chinese New Year 2018 takes place between 16 and 20 of February this year. The lunar new year starts on Feb 16th. Our offices in China will be closed from the 15th February to the 21st February. Translation into Chinese will be limited during this time. If you need Chinese translation you should start it now. Our Chinese office will also be closed on February 28th for Peace Memorial Day. The Korean Lunar New Year also in on 15-16 of February so our office in this region wil also be closed. The latest version of STAR Transit integrates with a number of Machine Translation Systems. Here’s how to make your translation faster. Machine Translation (MT) systems can be used when working with Transit. 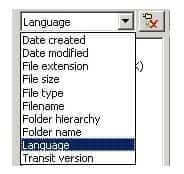 The project-specific settings for the Import MT are specified by the client or project manager on the Machine translation tab of the Project settings window . Import MT suggestions are displayed to you as translator in the fuzzy window, together with the fuzzy matches that may exist. Machine translations by online services are supported only via the Transit editor. The translator needs to request them explicitly for individual segments (see section 4. “Manually requesting a machine translation”). Therefore, they are referred to as Editor MT. 1- Select Transit button | User preferences. 2- Select the Machine translation option. 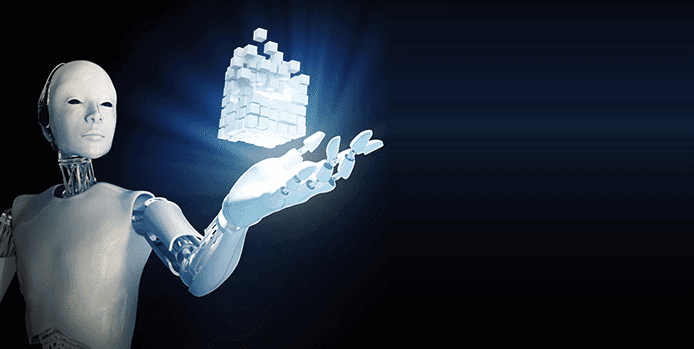 IBM has developed a number of fundamental technologies and innovations in hardware and software, including in the field of artificial intelligence (AI). 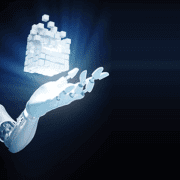 IBM has been marketing its AI solutions under the name Watson since 2010. Watson found fame back in 2011 when it won the US quiz show Jeopardy! 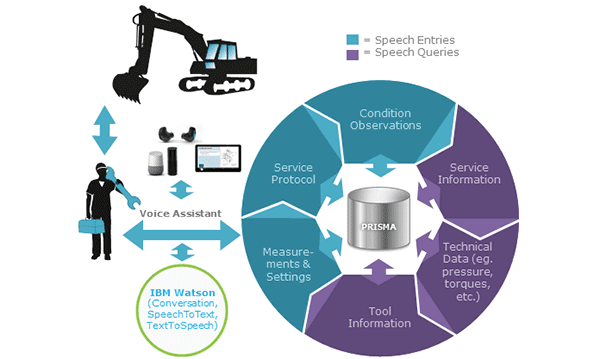 As a pilot collaboration project with IBM, STAR has implemented the PRISMA voice assistant based on Watson’s speech APIs. 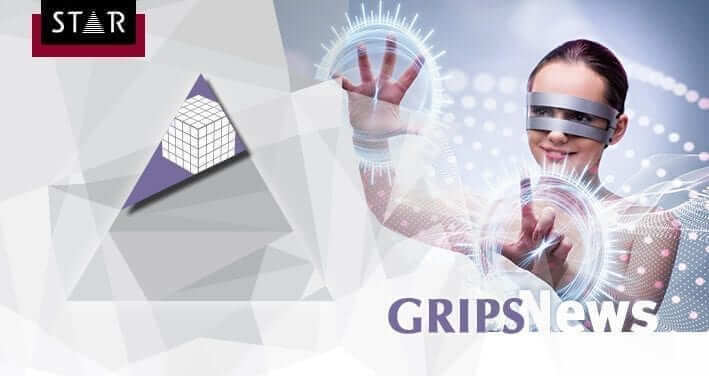 This enables PRISMA to interpret the semantic GRIPS information directly using the voice assistant without having to develop and implement custom dialogues. Service technicians can use voice commands to view the current, previous or next step in a set of servicing instructions, or have the relevant step read out. When commanded, PRISMA can highlight the elements relevant to a specific work step in images and 3D models. Service technicians can enquire about the time remaining, which is calculated using the specified flat rate units. PRISMA answers questions about the tools and materials required. Measurements and settings can be entered using voice input. Service technicians can dictate information for the service report, status monitoring and field feedback. The voice assistant will be introduced over the course of 2018 as a PRISMA upgrade package. You will receive more information about this in the GRIPS newsletter as and when relevant. This year’s annual tekom conference in Stuttgart saw STAR unveil its latest new development before a packed audience: PRISMA provides intelligent content for digital processes and working environments, thereby supporting current and future trends such as Industry 4.0 and the Internet of Things. 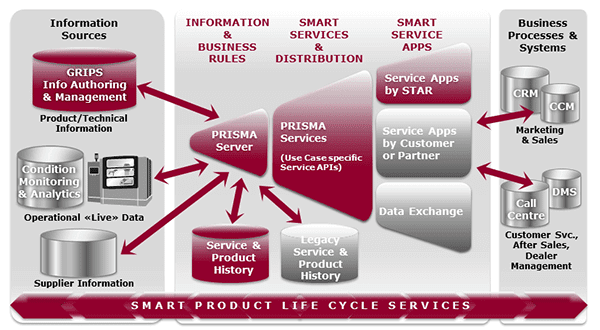 PRISMA (“Process-oriented Real-time Intelligent Service Memory and Assistant”) is a server platform for smart content services and one of STAR’s biggest milestones since GRIPS..
Current discussions about digitalisation focus all too often on IT-controlled processes, which ignores the fact that even in a digitalised process, some work steps still have to be carried out manually. Yet it is precisely these digital processes that are posing new challenges to workers, in that they are expected to not only be more flexible but also able to cope with requirements changing constantly and increasing time pressure. This is why staff need cutting-edge digital support that is flexible and can help them get their “Work 4.0” done productively. Many digitalisation projects will not achieve their objectives without digitalised Work 4.0. PRISMA covers this “last mile” in the digitalisation process by embedding content in smart services, when it then turns into smart assistance. For vehicle servicing, for example, a static maintenance table used to have to be made available on a content delivery portal. But PRISMA now makes it possible to schedule maintenance intelligently, taking account of the intervals, product configuration, service history, service windows, availability of resources and the results of status monitoring. When performing “tailored” servicing, smart services help members of staff according to their specific qualifications and the difficulty of the task in question, providing them with short passages of text, 3D animations, augmented reality scenarios or even a voice assistant. PRISMA supports smart services by using GRIPS content, intelligent third-party data (such as imported delivery information in iiRDS format) and real-time data on status, context and staff qualifications, while applying business rules (for calculating time and costs, for instance) at the same time. The PRISMA dashboard for scheduling intelligent servicing on a truck-mounted crane provides an example of the numerous possibilities available. It goes without saying that it can be adapted to suit the specific customer in each case. Personal vehicle data: Information specific to the vehicle – such as its Vehicle Identification Number (VIN), model name and commissioning date – is shown at the top right. Product status: Under “Product Status”, users can see the next suggested service date (14th December 2017) and the number of operating hours that will have been reached by then – calculated using an average of eight hours a day in operation. If the machine is currently being used more than average, the duration of use can be manually updated at any time. Details of the service: The middle part of the dashboard shows staff how long the suggested service will take (“Downtime”) and how much it will cost (“Budget”). Expenditure is divided into time (419.5 minutes) and material costs (€33.5). The next suggested date for carrying out a service (27.12.2017) is also displayed. Service timeline: The timeline (“Maintenance Points”) shows the service history, the service date currently scheduled and other calculated appointments. The scope of the individual servicing tasks is represented by the size of the circles. Overview of servicing and materials: At the bottom left, staff can see which servicing tasks they need to carry out – including how much they will cost, how long they will take and what qualifications they need to complete them. A traffic light symbol also shows whether the required materials are already available (green), whether they will be delivered before the service date (yellow) or whether they still need to be ordered (red). Overview of future service dates: The dashboard displays future scheduled service dates at the bottom right. These can be added to the current service date manually in order to combine servicing tasks and therefore lengthen the interval between one service date and the next. STAR will be developing more smart services focusing on after-sales in the next few months. Smart services for other areas, such as for end users, in production, in marketing, etc., are also in the pipeline. Sources of information: GRIPS is not the only source of information – data/content is also taken from suppliers and third-party systems (e.g. in the new standard iiRDS format), from status monitoring, from (big data) analytics or from an existing product/servicing history. Smart service apps: The apps can be obtained from STAR or developed by the customer using the GRIPS API as a basis. Other business systems can exchange information with the PRISMA server too. Media: New media such as augmented/virtual reality and voice assistants can be incorporated into PRISMA and read out too. Lower total cost of ownership thanks to optimised operation, servicing, troubleshooting, etc. Improved insertion of images using drag and drop: You can now drop multiple images on an insertion tag for an information unit (IU). The IU anchors are generated automatically and named according to the file name of the image.If permitted by the project structure, an image IU anchor can also contain multiple images. This makes it easier to link different views of the same object, for example. Improved Cockpit data conversion: The conversion of special characters (such as “&”) when saving and loading Cockpit data has been optimised to avoid publication errors. Optimised memory manager for Windows 10: The GRIPS memory manager has been improved in order to prevent crashes that occur in Windows 10. Hyppytyynytyydytys is a strange Finnish word that doesn’t have a direct translation in English. It means “Bouncy Cushion Satisfaction”. 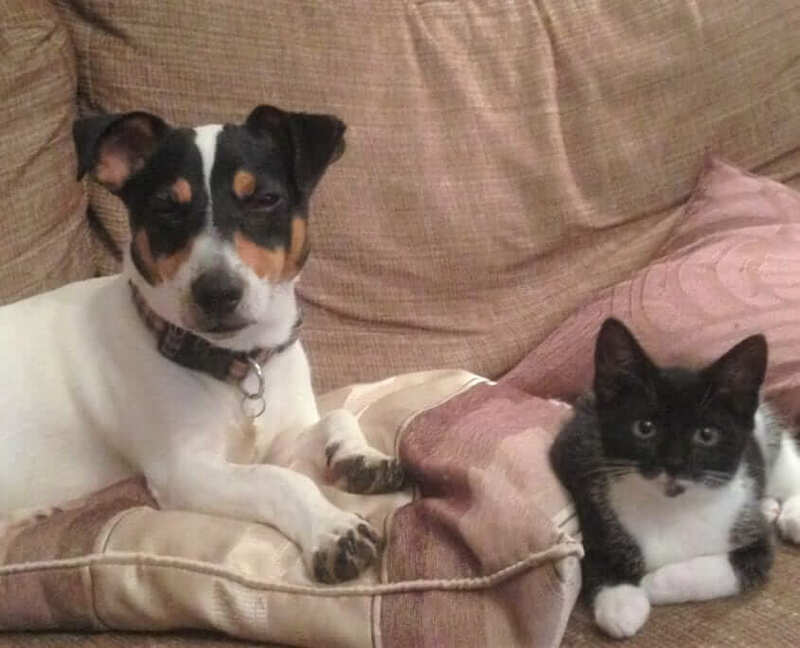 You know the feeling when you settle down on a cushion and just have that “aaaah” relaxing moment. At STAR we love language and how we communicate worldwide. 1. It has no English translation. 3. It has 18 letters in the world, but ony uses 7 actual letters. Plenty of repeat letters. 4. And it looks funny. What words do you know that have no English translation? PS. 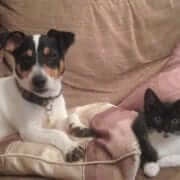 Thanks to Monty and Kaspar for posing for our photo.